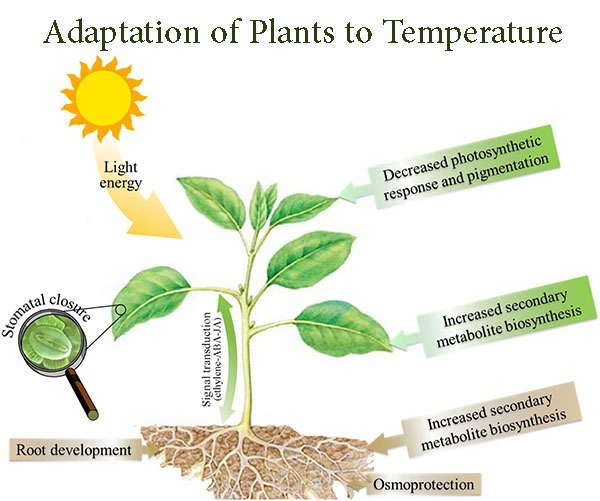 The adaptation of plants to temperature have greatly succeeded in development with the passage of time. They have developed a number of morphological and physiological characteristics during the course of evolution in order to meet extremes of temperature conditions. Formation of dormant bulbs, tubers; leaf fall and associated dormancy during winter or dry season help seasonal plants to overcome unfavourable temperatures. Sun leaves of Oaks are smaller and have deeper lobes than shade leaves increasing the surface area exposed to the air for cooling. Desert plants develop small leaves or no leaves at all and carry on photosynthesis through the stems to avoid transpiration. The plants resist to both minimum and maximum temperature extremes by producing thick-walled spores. Many species of plants, especially cacti, can acclimate to high temperatures. Such plants generally have high levels of bound water and high cytoplasmic viscosity. They are able to synthesize proteins at a sufficient high rate to equal the protein break down because of rising temperature. The removal of water from seeds helps overcome extreme cold temperature because there is no water to freeze. Dry seeds are able to germinate even after their exposure to -190°C for a period of three weeks. Dormancy help seeds in overwintering. Similarly, aestivation that occurs during summer help some plant species to resist high extremes of temperature. Certain plant species, when exposed to a rapid rise in temperature, shut down— normal protein synthesis and replace it with a set of heat shock proteins that aid in short-term survival. Plants growing in cold climates become dormant when temperatures drop below the minimum for growth, although respiration and photosynthesis may continue. During growing season some plants avoid chilling and frost damage by increasing their sugar and sugar alcohols to lower the freezing point of cells fluids. This results in super-cooling of cell sap for short period of time. Cell sap lowers to a temperature somewhat below freezing without freezing immediately. The plants that live in warm habitats and require high degree of heat throughout the year are megatherms. They are found in tropical areas, i.e., deserts, etc. These plants are found in tropical and sub-tropical habitats and can withstand extremely high and low temperatures. The plants that require low temperature for their growth are called microtherms. These are found in tropical and sub-tropical areas at high elevation where temperature remains low. These are plants of cold and alpine regions. They can withstand very long and severe winter.